Your father squeezes your hand and you make a sound that is part sigh, part giggle. You dare not glance at him because you’ll either bust up laughing or burst into tears. The Hawaiian steel guitar combo starts an island-flavored “Bridal Chorus” and you give dad’s hand one last squeeze before stepping out together into the spectacular tropical meadow that is your wedding. There, amidst the swaying palms, heady orchids, waterfalls and sparkling ocean beyond, sits everyone you know and love. The scene is somehow even better than you’d imagined. If you weren’t cradling your plumeria bouquet in one hand and holding tight to your dad with the other, you would be pinching yourself. So what is it that made Koloa Landing® Resort your choice as the best Kauai wedding destination? You and your fiancé felt so at home on Kauai’s sunny South Shore, and Koloa Landing® captured what you loved most: The pristine beauty of the landscape and an elegant but relaxed vibe. You had once considered a ceremony right on the beach but were concerned about your guests’ comfort and convenience. 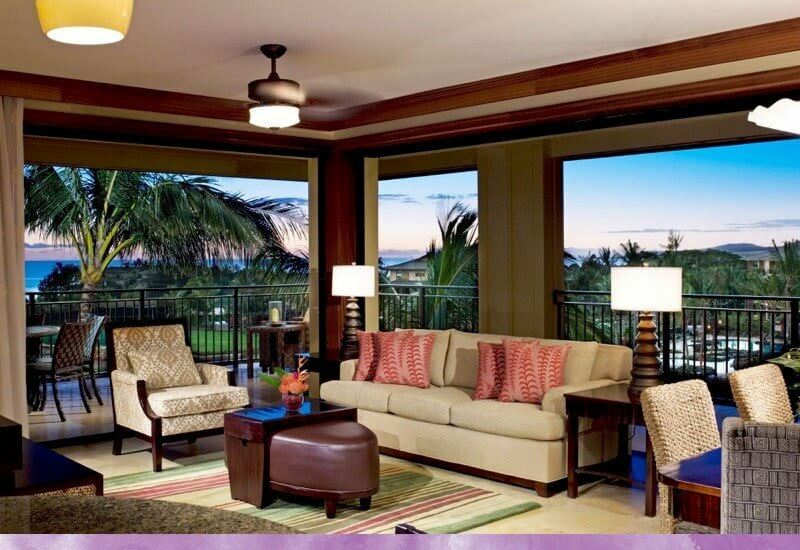 At Koloa Landing® you got the best of both worlds: proximity to the glorious ocean and picture perfect spaces full of easy luxury. The resort offered vast and well-appointed indoor-outdoor venues. The outdoor spaces boasted more than 16,000 square feet of fragrant foliage, curved pathways, bridges, lagoons, and manicured lawns. A 12,000-square-foot ballroom flowed seamlessly onto an 8,000-square-foot covered lanai and then out to the meadow beyond. Your fiancé loved the indoor-outdoor feeling and after entertaining myriad options you chose to have your ceremony on The Garden lawn under the swaying palms during that golden hour just before sunset, followed by craft cocktails and a gourmet seafood feast on the tiki-lit lanai, and finally dancing on the grass in a circle of twinkle lights under the stars. You collaborated with Chelsea Smith-Wishard, the resort’s wedding designer extraordinaire, who right away put you at ease. When you were unable to travel out from the mainland, Smith-Wishard was happy to FaceTime and walk you through the venue. She asked questions about details you hadn’t even thought of yet and clearly understood your budget. You then received an easy-to-follow timeline and proposal. You requested a sea of plumeria blossoms lining the aisle and enough tiki torches to (nearly) put the fire department on standby. Done. You had dreamt of a ukulele quartet playfully strumming “your song” mid-ceremony to surprise your fiancé. Check. From photos and favors to menus and music, Koloa Landing® offered vendor options galore and handled every nuance to elegant perfection. They promised that on your wedding day you would be free to relax with your loved ones and simply soak it all in. Now, as you make your grand entrance across an orchid-wrapped wooden bridge over the lagoon, you catch sight of your fiancé for the first time today. He looks as happy as you feel. For more information go to Koloa Landing® Resort Weddings You can fill out a contact form at https://koloalandingresort.com/contact-us/ or dial our team direct at (808) 201.3805.